Tooth (plural: Teeth) is a small calcified structure found in the mouth or jaws. It is generally used to break down food and for hunting, chewing and grinding. Root of tooth is covered with gum. Paleontologists study teeth and try to identify fossil species and determine their relationships. Sharks develops new set of teeth every two weeks replacing the old worn out teeth. Dog saliva has high pH (than human) and hence are less likely to form dental cavities. Human being has around 32 teeth. Average person develops two sets of teeth in his lifetime. The Enamel covering crown of the teeth is the hardest tissue in the entire body. Most people prefer to use a Blue-colored toothbrush over Red. Teeth are used to help break down food. Humans form 2 sets of teeth over the course of their lives. The first set (sometimes called baby teeth) features 20 teeth. The second set (sometimes called adult teeth) features 32 teeth. Baby teeth are usually replaced by adult teeth between the ages of 6 and 12. 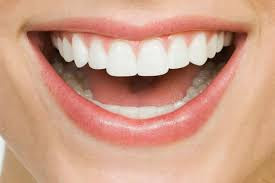 Humans have a variety of teeth including molars, premolars, canines and incisors. Incisors help bite pieces from food. Canines help hold and tear food apart. Teeth are covered in a hard substance called enamel. Teeth are surrounded by gums. Cavities can damage a tooth if left untreated. Braces are often used to help straighten or align teeth. The first commercial dental floss was made in the year of 1882. 40% of people above 65 years do not have a complete set of teeth. Human dental plaque contains more than three hundred species of bacteria. Adult horse has between 36 and 44 teeth. Rabbits are usually born with permanent teeth. Walrus teeth (tusks) grow continuously throughout life. Dolphins use their teeth to grasp only and not to chew because their mouth only has muscles. Molar tooth of Elephant’s weights about 4 kilograms and almost 7" square. September 20 is observed as 'Love your Teeth Day' in China. People in English during 1800s used to eat in their bedrooms before gatherings and events at the dinner table so as to be not embarrassed about their teeth falling during dining. Germany used to have a Middle Age custom of kissing a donkey to relieve from toothache. Lucy Hobbs is the first woman in United States to get a dental degree. She got it from the Ohio college of Dental surgery in 1866. Sir Isaac Newton has the most valuable teeth. His tooth was sold in London for $3,633.00 in 1816.